A 75-year-old man presented with deterioration of right eye vision for 6 months. He had no relevant medical history. Fundus examination revealed subretinal fluid, fibrosis, and subretinal hemorrhages. Ocular coherence tomography of the right macula illustrated an underlying subretinal lesion with internal lamellae, resembling trabecular bone elsewhere in the body. Bruch's membrane was clearly intact beneath the lesion, indicating an extrachoroidal location. The lesion appeared highly reflective on B-scan ultrasonography, consistent with ossification. Although initially misdiagnosed as choroidal osteoma, this lesion represents in-vivo intraocular osseous metaplasia at the site of neovascular age-related macular degeneration. The authors believe that similar lesions may have been misdiagnosed as “atypical” osteoma caused by failure to identify their extrachoroidal location. Mature bone formation within the eye, or intraocular ossification, is rare and easily distinguished from calcification, which is disorganized and dystrophic. Intraocular ossification has an organized structure resembling trabecular bone elsewhere and comes in two distinct forms: choroidal osteoma or osseous metaplasia (OM). The two forms are not considered the differential diagnoses of each other; the former is a clinical diagnosis, with characteristic presentations and appearances, whereas the latter is regarded as a histopathological finding. We present a case which challenges this assumption. A 75-year-old man presented with 6 months of progressively deteriorating right visual acuity from 20/30 (best recorded Snellen) to 20/60. Nine months ago he had a cutaneous nodular malignant melanoma (Breslow thickness 2.4 mm) excised from his left arm. Apart from this, he had no other medical or ophthalmic history. 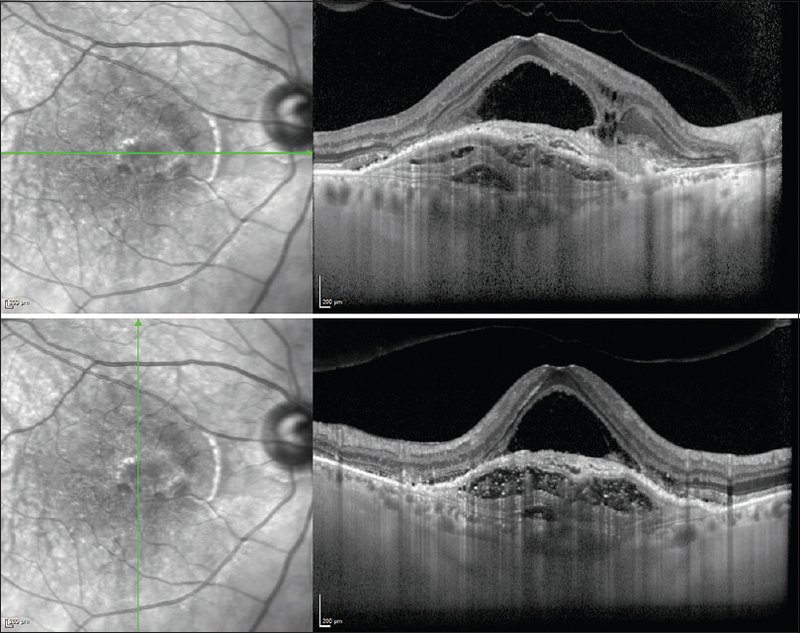 Initial ophthalmic examination detected a raised submacular lesion in the right eye, which was associated with subretinal fluid, subretinal fibrosis, and hemorrhages [Figure 1]. Ocular coherence tomography (OCT) revealed an underlying mass. The lesion appeared hyperdense on B-scan ultrasonography (US), with an acoustic shadow. The unaffected left eye had multiple, large macular drusen, but was otherwise unremarkable [Figure 1]. A clinical diagnosis of choroidal osteoma with secondary choroidal neovascularization (CNV) was made at this stage, and the patient was referred to a tertiary centre. Repeat fundus examination of the right eye remained unchanged [Figure 1]. It was noted that the clinical presentation was not typical of choroidal osteoma; first, this was an elderly male, and second, there was no characteristic yellow-white choroidal mass with well-defined borders. The funduscopic appearances would have been more typical of neovascular age-related macular degeneration (AMD). B scan US [Figure 3] of the right macular lesion (5.13 mm diameter, 1.31 mm thickness) showed its hyper-reflectivity even at low sensitivity and cast an acoustic shadow. This appearance would be consistent with a calcific lesion. No further radiological investigations were performed as there was no suspicion of extraocular involvement. The combination of clinical presentation, fundal appearance, and extrachoroidal location on OCT strongly suggested that the diagnosis of choroidal osteoma was inaccurate. Neither was this sclerochoroidal calcification as the lesion had an osseous internal structure and was located pre-Bruch's membrane at the posterior pole. A diagnosis of OM of CNV from AMD was made, however, this can only be definitively confirmed by histological examination. The patient was discharged back to his local ophthalmologist for management of his AMD with intravitreal anti-VEGF injections. To date, he has received five intavitreal aflibercept injections to the right eye without significant improvement in the amount of subretinal fluid. His last recorded visual acuity was slightly worse at 20/80. OM is defined as the presence of heterotopic bone tissue, including all constituent cell types, in a soft tissue. Literature reports of intraocular OM are histopathologic studies of enucleated specimens. The pathophysiology is not known, however, the majority of cases are associated with phthisis bulbi or severe trauma., Chronic inflammation and chronic ischemia have been implicated. The location of OM is always at the site of the disease, which is frequently subretinal. There are no reports of the OCT or US features as it has never been studied in vivo. In contrast, several case series of choroidal osteoma describe the key clinical features. Osteomas are rare, benign, ossifying tumors of the choroid, composed of mature bone with a hypocellular marrow. Characteristically, they appear slightly elevated, yellow-white, with well-defined borders in a juxtapapillary position. There is a female preponderance, and patients typically present in the second or third decades of life. Significantly, they occur in otherwise healthy eyes (cf. OM), and no pathophysiological causal factors have been identified. Secondary CNV formation is seen in approximately 50% of cases. In all cases, choroidal osteomas are located within the substance of the choroid, deep to Bruch's membrane. Some lesions labeled as “atypical” osteomas have been described in the literature. These discrete, hyperdense lesions share some of the features of classical osteomas, and are highly reflective on US. However, they usually appear in older patients who have had ocular pathology at the site of their so-called “osteoma.” One such case described a lesion which occurred years after panretinal photocoagulation for a branch retinal vein occlusion. The lesion is clearly pre-Bruch's membrane, and therefore extrachoroidal on OCT, and hence is by definition not a choroidal osteoma. We believe these “atypicals” are actually intraocular OM secondary to the underlying pathology, as in our case presented above. To our knowledge, this is the first in-vivo identification of intraocular OM, describing its clinical, OCT, and US appearances. This case highlights the need to broaden the differential diagnosis of ossified intraocular lesions and is a direct result of improved ophthalmic imaging technology allowing near histological identification of tissues. Of interest is that OM has occurred early in mild disease in this case – a first presentation of neovascular AMD with relatively good vision and only focal subretinal fibrosis. This is in contrast to previously reported cases from histopathological studies of enucleated, severely diseased eyes. The authors would like to thank Tom Evans, Lead Ophthalmic Science Practitioner at the Royal Hallamshire Hospital, Sheffield, for his invaluable technical support and expertise. This work was presented as an oral presentation at the North of England Ophthalmological Society Spring Meeting, 13th March 2018, at Wetherby Racecourse, LS22 5EJ, England. Shields CL, Shields JA, Augsburger JJ. Choroidal osteoma. Surv Ophthalmol 1988;33:17-27. Bataille S, Daniel L, Legris T, Vacher-Coponat H, Purgus R, Berland Y, et al. Osseous metaplasia in a kidney allograft. Nephrol Dial Transplant 2010;25:3796-8. Vemuganti GK, Honavar SG, Jalali S. Intraocular osseous metaplasia. A clinicopathological study. Ind J Ophth. 2002;50:183-8. Finkelstein EM, Boniuk M. Intraocular calcification and hematopoiesis. Am J Ophthalmol 1969;68:683-90. Adhi M, Bryant JS, Alwassia AA, Chen C, Duker JS. 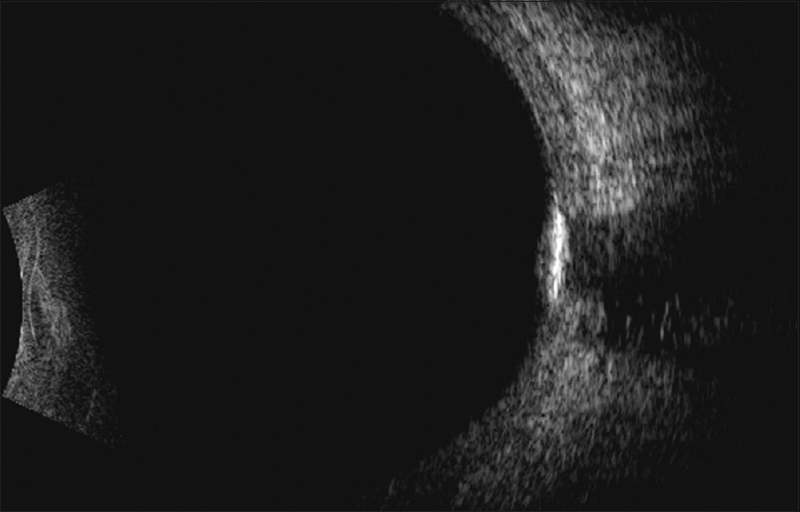 De novo appearance of a choroidal osteoma in an eye with previous branch retinal vein occlusion. Ophthalmic Surg Lasers Imaging Retina 2013;44:77-80.